Breakfast is serious business in our house. Every morning this little face wakes up and the first thing she ask’s for is food. I do my best to cook her a solid meal like oatmeal, eggs, or french toast, but, between managing a 7 week old and getting M ready for school in the morning, sometimes quick and easy is exactly what we need. 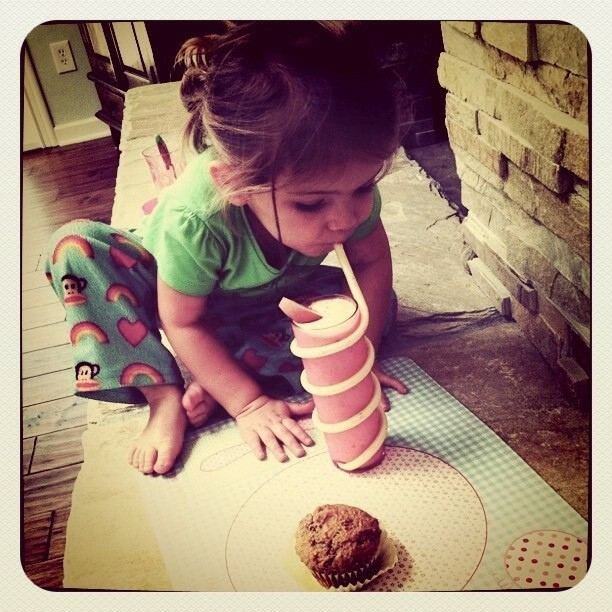 Smoothies and muffins are perfect. At some point during the week or the weekend, I like to cook a batch of oat bran muffins and I always make sure we are stocked with both fresh and frozen fruit for smoothie making. M is obsessed with smoothies. Her flavor of the moment is peach. 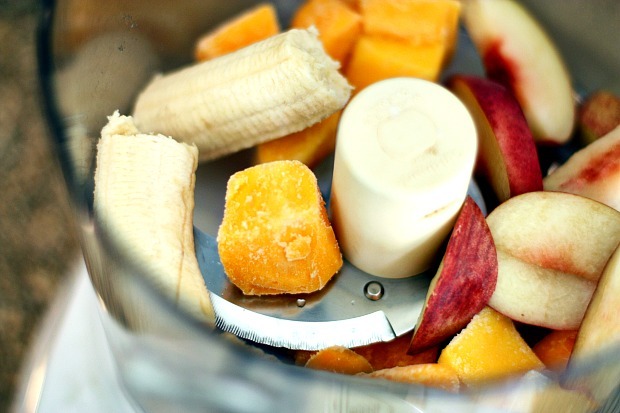 M’s Peachy Keen Smoothie consists of fresh peaches, frozen mango chunks, a banana, and low-fat milk. And of course, a super cute cup makes drinking smoothies extra fun. 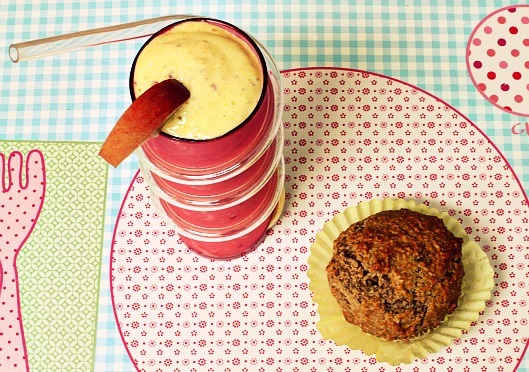 Smoothies + Muffins makes for a perfectly quick breakfast! Place all ingredients in a blender or food processor. Blend until smooth & enjoy! Combine all dry ingredients in bowl and whisk until blended through. In a separate bowl, combine your vegetable oil, applesauce, and eggs. Add the wet ingredients to the dry ingredients. Stir until all ingredients are mixed through. Line a muffin tin with baking cup liners. Spoon batter into cups about 3/4 full (I like to use an ice scream scoop for accuracy). Bake at 400 degrees for about 12-15 minutes or until golden brown. M is getting so big! 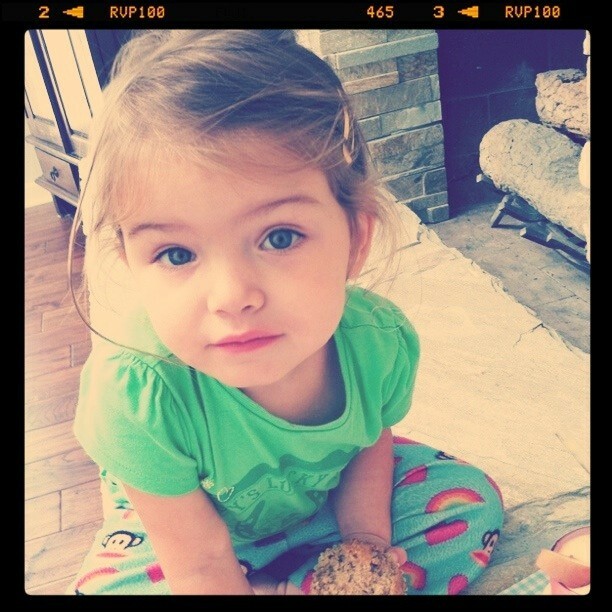 She’s adorable. How many servings does that smoothie make? I love that cup, too! Do you by chance remember where you found it? I might have to get one! Now that is one awesome straw! I have kinda been obsessed with peach smoothies lately. Thy just taste so good! this would be a good breakfast for ME! Making muffins in advance is a great idea– I’m so impressed with your kitchen skills– I hope I’m still cooking like you when we have kids! I agree with Jessica…I want this breakfast! ohmygosh! LOVE! where i can find that CUTE placemat??? love it!! I hear ya on the breakfasts. Quick, easy and nutritional is key in the morning! This looks perfect and I LOVE the cup! Too cute! 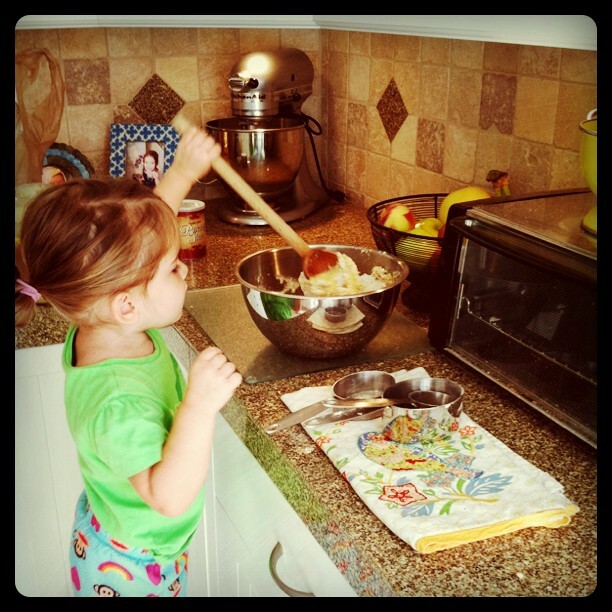 Estela – I made your healthy mac and cheese last night for my parents, we all LOVED it! I added some broccoli to it which worked great. 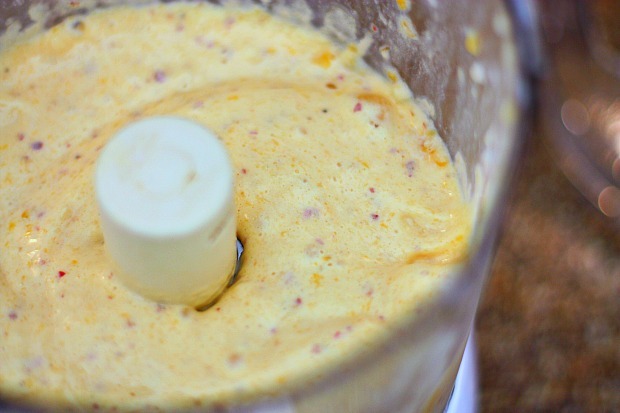 I’m planning on making the homemade pimento cheese recipe this weekend for my boyfriend’s birthday cookout. I can’t wait! 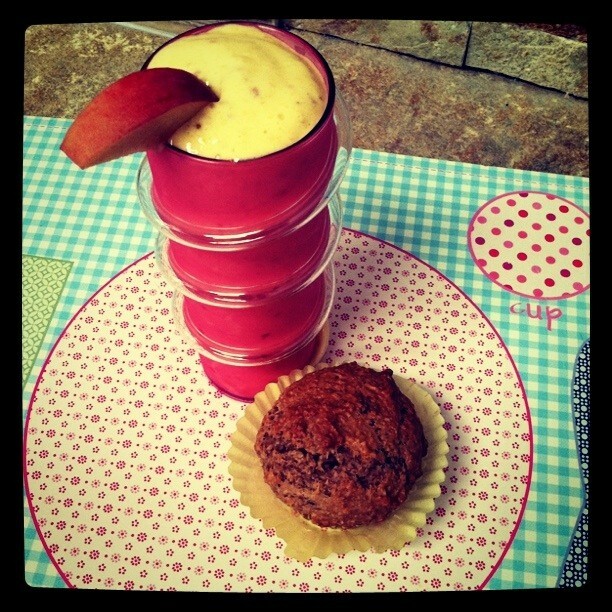 The muffin and smoothie both look delicious! I definitely wouldn’t mind starting out my day like that! Love the cup and placemat too!